But his passion for the game deepened when, as a kid, he would sit in the stands at Rogers Arena and watch his beloved Vancouver Canucks. His family had season tickets and he would study the moves of players like Markus Naslund, Trevor Linden, Mats Sundin as well as Daniel and Henrik Sedin. Even though Sundin suited up for only 41 regular-season games and eight more in the playoffs with the Canucks in 2008-09, he took particular interest in the way the big Swede played. Several years later, Rasmussen would be represented by player agent J.P. Barry, the same agent Sundin had in his legendary career. Barry saw physical similarities between his new client and the 6-foot-5, 231-pound Sundin. So Barry suggested to Rasmussen that he watch old tapes of the 2006 Olympic gold medalist. British Columbia is rich in young hockey talent – from Ryan Nugent-Hopkins to Mathew Barzal to Ryan Johansen to Evander Kane to Tyson Barrie – and the list goes on and on. One of the next on the list is the 19-year-old Rasmussen. The Red Wings selected the slick offensive forward from Surrey, B.C. ninth overall in the 2017 NHL Draft. Rasmussen believes that because the Canucks were one of the elite teams a decade or so ago, their success helped in the development of local young talent. “Going to those games back then elevated my love for hockey. It took off from there,” said Rasmussen, who attended the 2018 NHLPA Rookie Showcase in Toronto last month. Rasmussen hopes to one day compete for a Stanley Cup championship with Detroit. 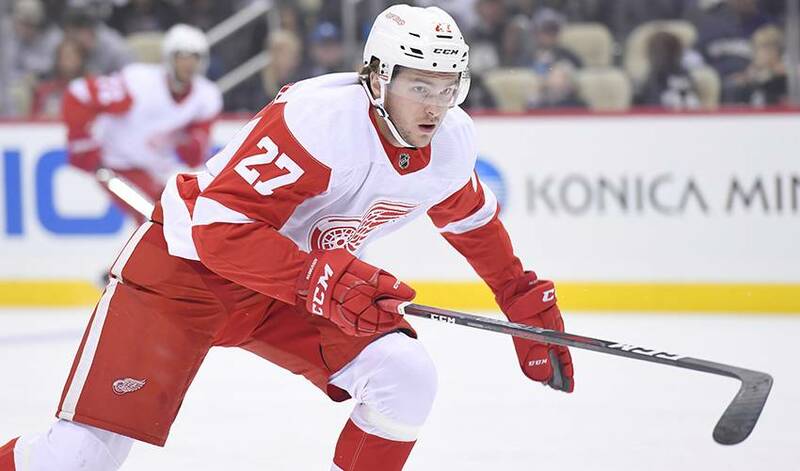 He was impressive for the Red Wings rookies in the annual Prospects Tournament in Traverse City, Michigan, against young players from the New York Rangers, Columbus Blue Jackets, Carolina Hurricanes, Chicago Blackhawks, St. Louis Blues, Dallas Stars and Minnesota Wild. He continued that success to make the Red Wings opening-day roster as a teenager, even making the transition from centre to right wing. He is slated to play in Detroit's home opener against the Columbus Blue Jackets on a line with centre Frans Nielsen and left wing Tyler Bertuzzi. Even though he made the Red Wings out of training camp, Rasmussen still could be returned to junior with the Seattle Thunderbirds and he would be a strong candidate to play for Canada at the World junior championship in Slovakia over the Christmas holidays. “I went to training camp in Detroit last year and played in a couple of exhibition games,” Rasmussen said. “It was good to get that experience and helped me to take the next step. “I was excited to go back. You want to play well and do your best. It will be another awesome experience."